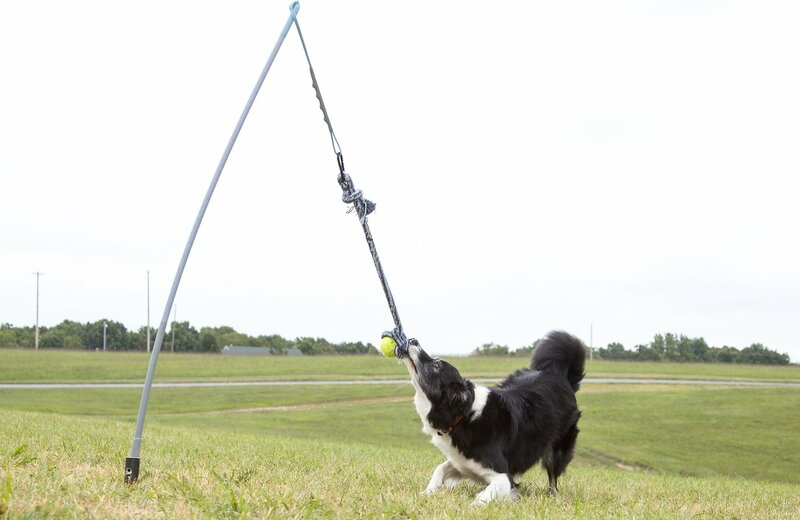 Tether Tug Outdoor Dog Toy is an interactive outdoor tug toy that provides hours of fun and exercise for your dog. It’s a unique, flexible design that features a lower hanging braided rope for easier reach. 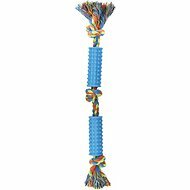 This tug toy gives as it goes, allowing for extensive bends, turns, flexes and flips with ease and provides exercise your dog needs to strengthen his little body, prevent destructive behaviors and stay mentally stimulated. Plus, your little buddy burns off extra energy without wearing you out. It’s the perfect toy to keep him healthy, happy and entertained. *These are recommended weights. 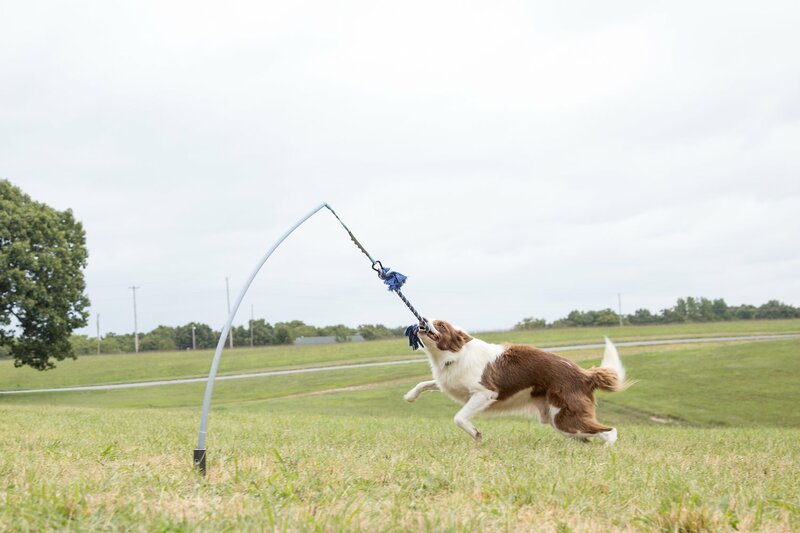 If your dog is a strong puller, go up a size. Purchased twice for my 6 month old German Shepherd, she weighed 50 lbs at the time, she destroyed the Tether Tug that was recommended for dogs up to 75 lbs in a couple days of play, so we replaced it with the UBER Tether Tug designed for dogs up to 175lbs, again she was able to destroy after several days of play, I contacted the manufacturer and explained the problem and was asked to send pictures, after they reviewed pictures they said my dog was to rough on the Tether Tug and I needed to monitor her while she played in order to keep from playing to rough with it, DON'T BUY! Bought this for my big 90 pound Rotti-Lab mix. She watched me setting it up with this look on her face like she was saying " I'll tear that thing apart in about 2 minutes". And sure enough, within a few minutes she was dragging the whole thing around the yard. It doesn't anchor down into the ground very well at all, and it doesn't spin around. I'm going to make serious modifications to this thing and see if I can improve it so that my pup will be able to enjoy it. It's a great idea, but very poorly designed. The anchor to the ground part of it is terribly designed. My dog loves to tug. Usually she tugs on the hose outside... but she eventually bites it in half. This toy she loves! She can tug all day long. Only downside is the ground is still soft from all the rain, she will pull it out. So I can't leave it out until the ground hardens. See pics below! Excuse the mess in the yard. 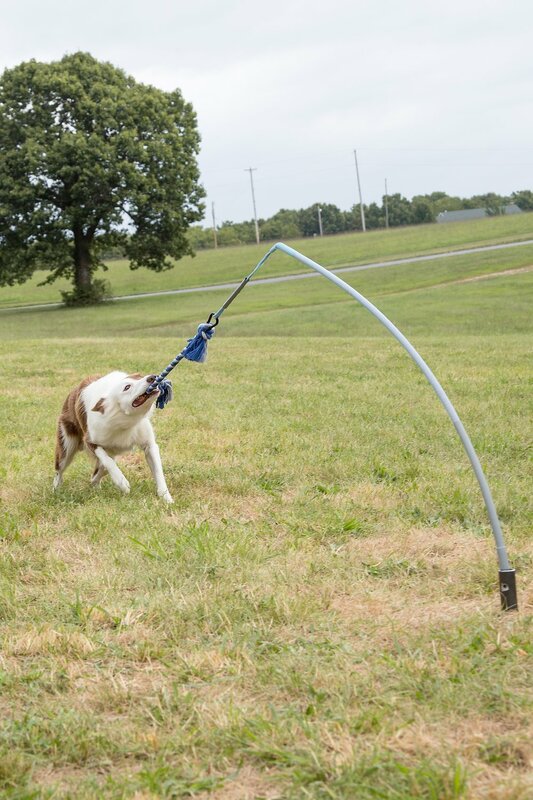 It is a very sturdy poll and my dog (A 50lb pitbull) absolutely loved it for about 5 minutes. Then she figured out that she can pull it out of the ground. I would recommend an end that screws into the ground. My 7.5 month old, 91 lbs, Rottweiler has beat the heck out of this thing since he was 10 weeks old. He loves it!! Yes, he has pulled it around and made the hole in the ground big enough that I have had to move it, but I can't see how some reviews say " dog pulled it out of the ground". If you properly hammer the insert into the ground it is impossible to pull out. I could see the tether possibly being pulled out of the insert if you don't have it on the right angle, but just use some common sense. Awesome product. We got this toy for our 3 year border collie, and only lasted 1 week before it broke. The part that connects to the pole on one end and the the rope at the other rip apart. In other words is useless now. My dog does not play with this at all, even if I take out of ground and twirl with it. not happy spent so much money on this for her. 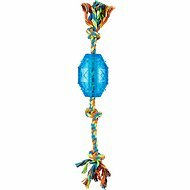 Great fun out door toy for active dogs. Love it and so does Camo.